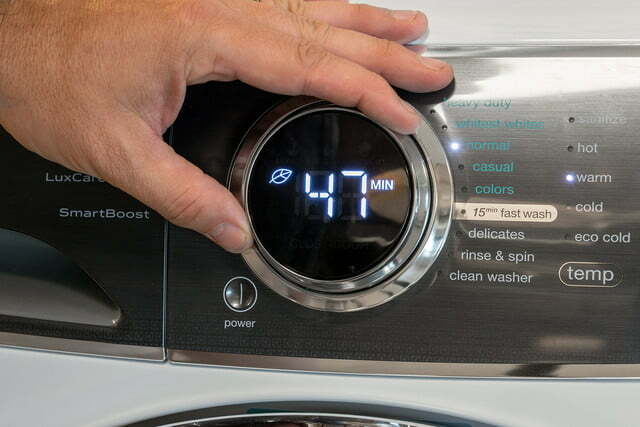 SmartBoost will make you wonder if your own washer is really getting your clothes clean. The first thing you’ll notice about the Electrolux EFLS617SIW Front Load Perfect Steam Washer is its Nest-like dial, which you use to select your wash cycle. It also lights up with the time remaining. 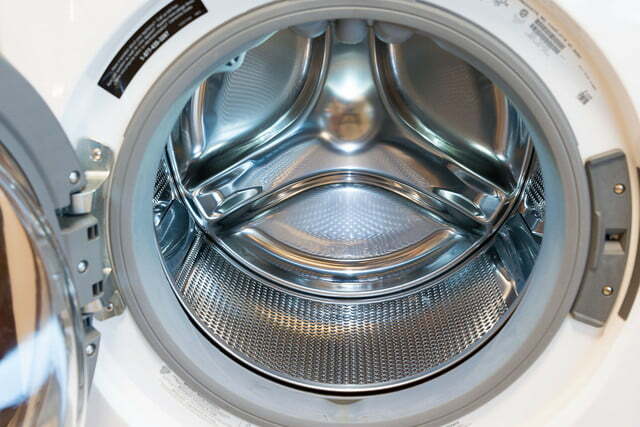 But it’s what’s inside the washer that sets it apart: the SmartBost technology, which provides a thorough clean by premixing water and detergent in a separate compartment before they hit your clothes. That means even the 15-minute fast cycle is surprisingly effective at delivering small loads of clean clothes. 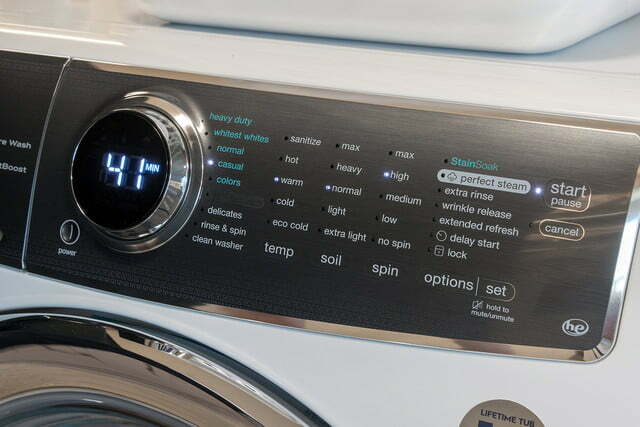 Lots of washers have dials, but we haven’t seen one that puts the display on it; it’s a small but sophisticated-looking change. The LED screen displays how long the cycle will take as you turn the dial and press the various buttons alongside it. 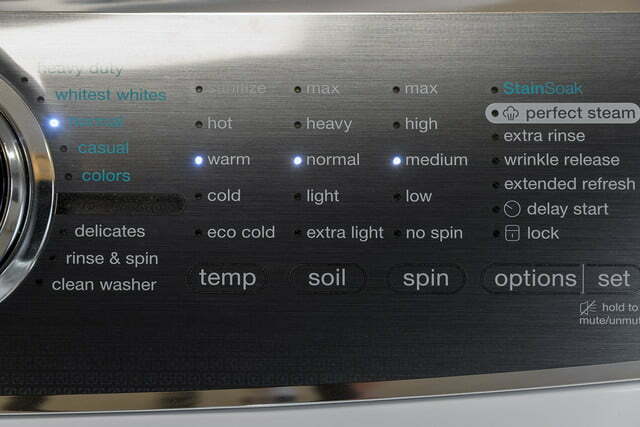 The control panel has three rows of buttons: one for temperature (sanitize, hot, warm, cold, and eco cold), soil level (max, heavy, normal, light, and extra light), and spin speed (max, high, medium, low, no spin). 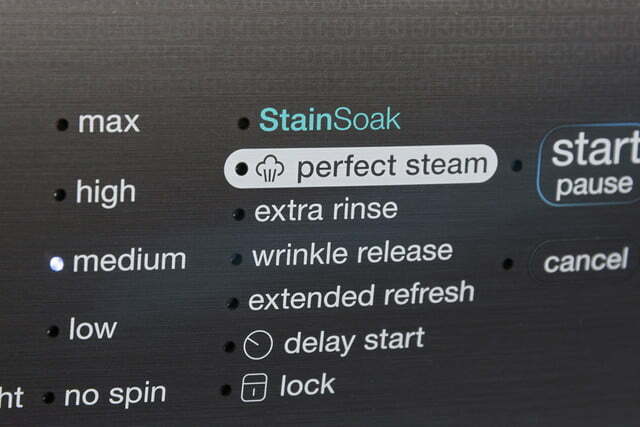 There are buttons for controlling the extra options as well, which include stain soak, perfect steam, wrinkle release, extended refresh, delay start, and lock. At the end are the start/pause and cancel buttons. 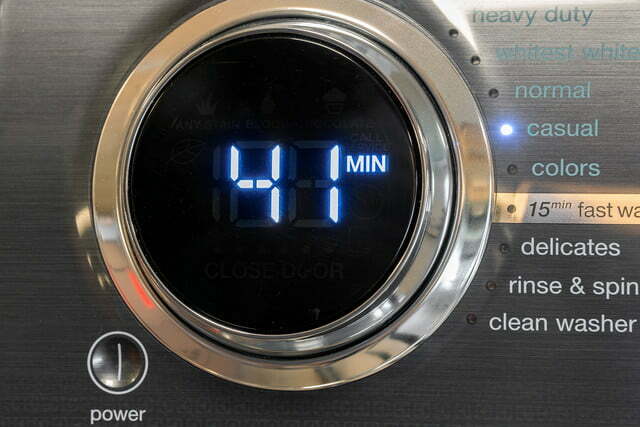 Even the 15-minute fast cycle is pretty effective at delivering small loads of clean clothes. 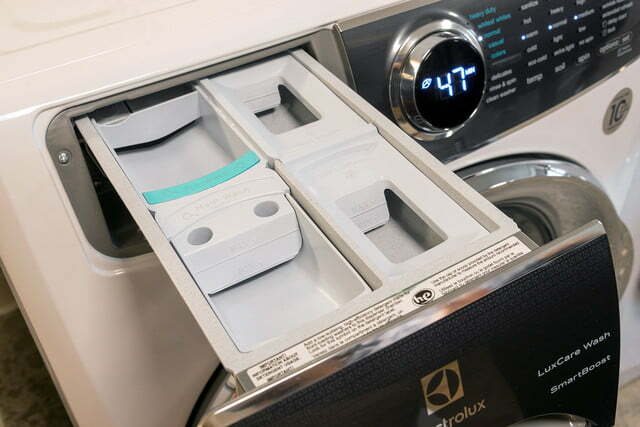 On the left is the detergent drawer, where you can load in detergent for the main wash and pre-soak, and there are compartments for bleach and fabric softener. A nice touch is that these have “maximum” and “minimum” lines, so you can gauge how much detergent to use (though for smaller loads, we definitely didn’t fill to the minimum line). The stainless steel drum has a capacity of 4.4 cubic feet, which easily handled a load of three pairs of pants, 10 shirts, three towels, and undergarments and socks. A bright white drum light stays illuminated to help you find stray socks but turns off after three minutes, so you can leave the door open between cycles (a good idea with front loaders). While the detergent drawer is in the same place as many others, the soap, fabric softener, or bleach doesn’t dispense right into the drum. Instead, it heads to a special chamber where it mixes with water, so what drops onto the clothes is fully saturated with the cleaning product. That actually makes a really big difference when it comes to clean. Blood, red wine, grease — whatever we threw at this washer, it got the stains out. 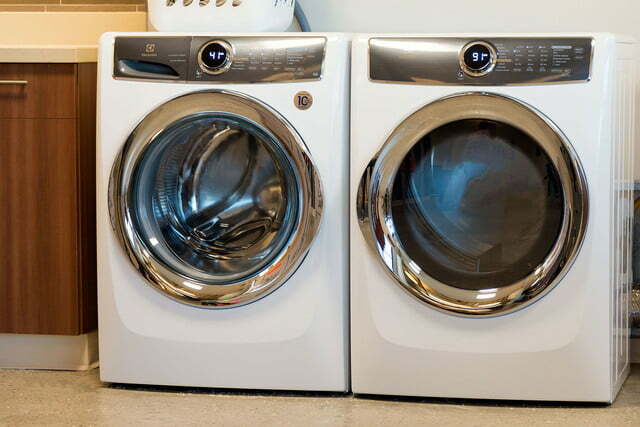 The 47-minute normal cycle did a great job, but the machine also has several options for super-stubborn stains. The stain soak feature lets you choose from “any” stain, blood, or chocolate. Each treats stains differently. The first heats water and mixes it with the detergent and whatever stain remover you add, tacking on an extra 30 minutes to the normal cycle. Hot water sets blood stains, so this setting uses cold water mixed with your cleaning agents and ups the time by 15 minutes. The chocolate remover takes an extra half an hour and heats the water twice to get out those s’more dribbles. Perfect steam is a wholly separate option and is used to help loosen stubborn stains with steam. For squirmy germs, the sanitize mode, when used with heavy duty or whitest white settings, will kill 99.9 percent of bacteria. 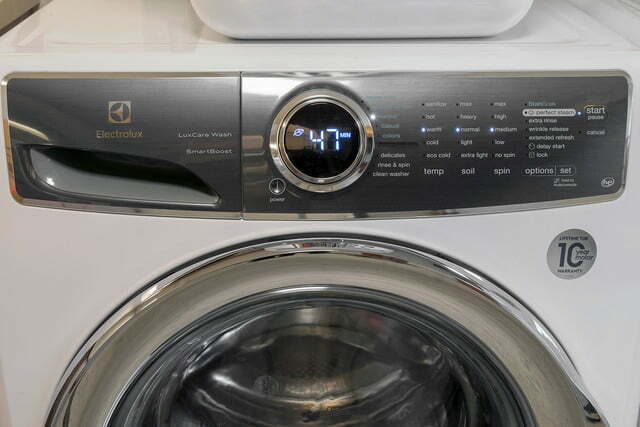 While it seems like a lot of washers add more and more cycles, this Electrolux has only nine: heavy duty (for things like sports equipment), whitest whites (don’t put your reds in here), normal (everything from towels to jeans to tees), casual (synthetic fabrics), colors (for “highly dyed fabrics”), 15-minute fast wash (little, not-too-dirty loads), delicates (knickers), rinse and spin (when you forgot to add the fabric softener), and clean washer (self explanatory). The machine also attempts to be foolproof: You can’t use the punishing sanitize mode on your delicates, for example. We found the delicates cycle to live up to its name, but some of the stain-booster options were tougher on fabrics. The 15-minute fast wash was true to its word, but some of the other cycles clocked in at longer than their promised time. In order to get out some stubborn stains, we set the cycle to whitest whites and added the chocolate stain soak and perfect steam options. Already a long wait at 140 minutes, the actual time it took was two hours and 43 minutes. The cycles were also just long in general, no doubt because of the extra time to premix the water and detergent. While a 47-minute normal cycle isn’t a deal breaker, it is longer than LG’s TurboWash, which takes closer to half an hour. Still, the results of these extended cycles are exceptionally clean clothes, so it’s not a bad trade-off. 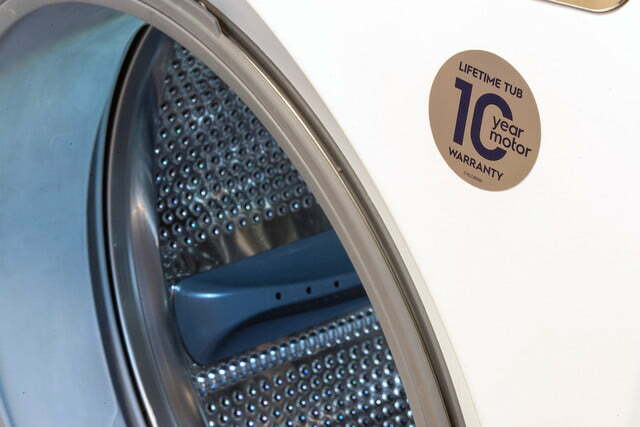 As with its other washing machines, Electrolux offers a one-year warranty with the EFLS617SIW. You can contact the company Monday through Friday, 8 a.m. to 8 p.m. ET, at (877) 435-3287. A couple weeks ago, I wore a can-only-be-washed-in-cold-water dress to a wedding. The Electrolux took care of the inevitable red wine stain, and it’s now in wearable condition. What better endorsement do you need? For a $1,099 machine that can you can buy at Sears for $900, you get a lot of deluxe features, but the SmartBoost is the real reason to get this washer. The cycles might be a little longer and the capacity a bit smaller than some of the competition, but you’ll be confident that your loads are coming out not just stain free but really clean. 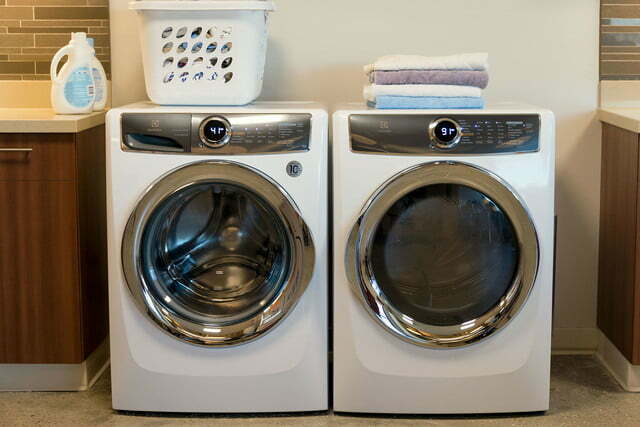 It’s always nice when we can recommend both a washer and dryer, for those who prefer a matching pair.